Very busy at the bus today on O Connell street in Limerick. The volunteers were kept busy engaging with passers by. 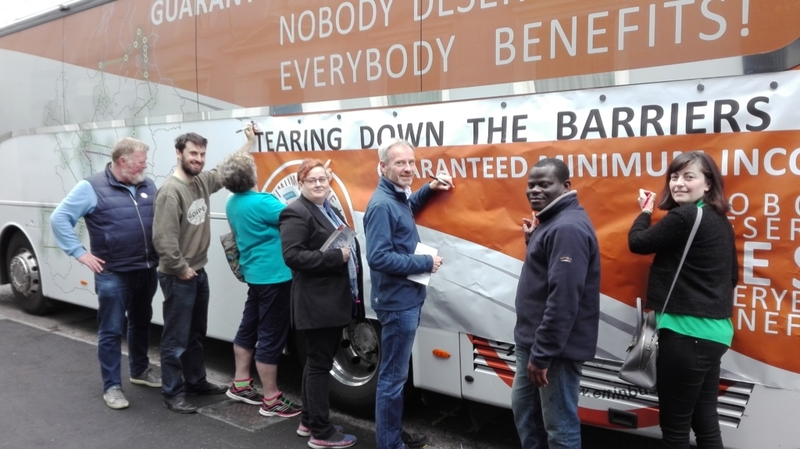 Many people were happy to support the bus action and signed the petition, others just wanted to express their opinions and there was many who could not be moved from their fixed negative perceptions about welfare and more particularly welfare recipients. 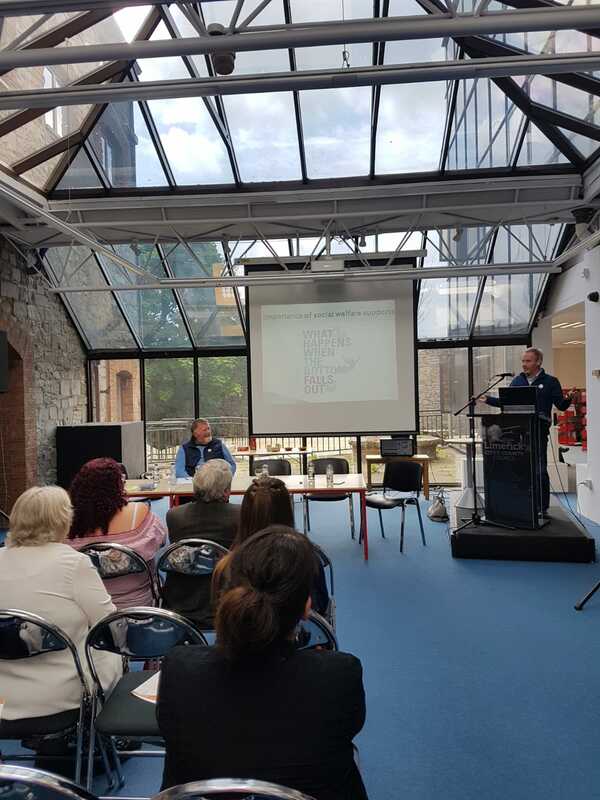 The subject of overcoming negative stereotypes and how to redress widely held misinformation in relation to welfare was also very present at the seminar held in the city library. A panel of cross party politicians recognised they have a role to play in informing the general public about the reality about welfare levels and to keep making the case for the positive role played by welfare. It was also highlighted that welfare supports is received by large numbers of people in our society and that without these supports the levels of poverty in Ireland would be three times greater. People who have benefited from welfare can also play a role to help to overcome stereotypes about welfare recipients. The complexity of the systems was recognised as a barrier both to access entitlements and to explain the systems to the general public. This was well illustrated by a person present who had direct experience of the issues. he also highlighted that without a supportive family it would be very difficult to manage the gaps in provisions. The call from the Irish EMIN organisers was to achieve agreement of and the ambition to meet a ‘minimal essential standard of living’ and lift people above the poverty line. This recognises that it is not only a question of the level of minimum income but also the access to the goods and services needed to live in dignity and to participate fully in the society. 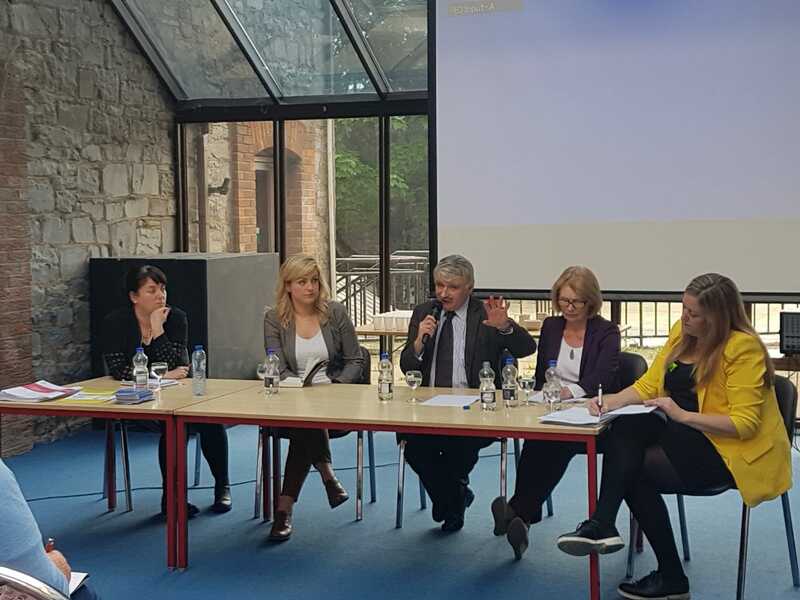 After prompting, the politicians recognised that in recent time Ireland has not being active in supporting and championing social initiatives at EU level. The politicians present expressed their commitment to become more active in promoting social Europe in the future. Also after prompting from one of the activists present, a discussion was had on the need for fair taxation and redistribution systems to ensure the financing of decent welfare systems. It is encouraging that the issue of redistribution gains increasing attention in discussion at all levels.